After creating a huge buzz in the US for being the first Hollywood-produced movie with an all-Asian cast in the past 25 years, Crazy Rich Asians is finally set to screen in the Chinese mainland this Friday. While the film set fire to the North American box office, earning an impressive $173 million after its August debut, it did not receive a mainland release date until mid-October. To help build anticipation, director Jon M. Chu, producer John Penotti and cast member Michelle Yeoh attended the film's mainland premiere in Beijing on Saturday. "This film is a representative work that all Chinese should be proud of!" Yeoh, the Chinese-Malaysian action film star known for her roles in titles such as Crouching Tiger, Hidden Dragon, said at the event, drawing loud applause and cheers from attendees sitting below the stage. An adaptation of Singaporean-American author Kevin Kwan's best-seller of the same name, the story follows Chinese-American professor Rachel Chu as she heads to Singapore with her Chinese-Singaporean boyfriend Nick Young to meet his wealthy family. While being celebrated as a "monumental" work, it has also sparked criticism from Chinese communities accusing the film of misrepresenting Chinese culture and promoting stereotypical depictions of the Asian community. 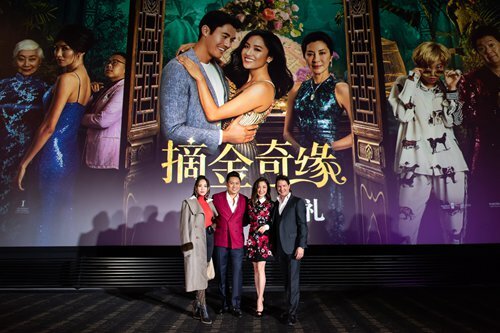 "The film is a satire, it's not about 'crazy rich' or 'Asians' actually, it's about the opposite of that - it's about how all those things mean nothing and it comes down to our own relationships and finding love and our own families," Chu told the Global Times in an interview before the premiere. Though the movie has turned the heads of Chinese movie lovers since its US premiere, critics have been dubious about its potential in the mainland, believing it is less likely to perform as well as it did in North America since Chinese audiences are less concerned about "ethnicity." "I hope they come and realize that it's about much more than that. And you know what? It's us who're making fun of ourselves. We get to laugh at ourselves - that's what comedy is about. If someone else does it, it can be hurtful," Chu said. Growing up in his father's Chinese restaurant - which is going to celebrate its 50th anniversary next year, the Chinese-American director has his own personal understanding of Chinese culture. The culture of family, sacrifice, cuisine and a down-to-earth spirit "were always there" growing up, and this impacted him while making the story, Chu said, adding that he specifically introduced certain Chinese elements to the movie, such as Chinese songs from the 1950s, after asking for suggestions from his parents. "I sent them the songs and they were so excited to hear them, saying 'We used to dance to that.' And even the food [in the film], I would send my dad a picture and ask 'is this done right?'" Chu told the Global Times. Among the most-talked-about parts of the film overseas are the scenes in which the Young family makes dumplings together and Rachel plays a game of mahjong with Nick's mother Eleanor. Chu said that the mahjong scene is meant to show the theme of the film: after "all the glitz and glamorous stuff" comes generations learning to live together. "These two women sitting down are willing to make sacrifices because they love the same person just as much as the other does," Chu said. "This is a good opportunity to show what a traditional Chinese mother is and also a time to show respect to all the mothers in the world," Yeoh, who plays Eleanor, noted. "Eleanor is vulnerable and human. She is a mother trying her very best to make sure her husband, her mother-in-law and son are and will be taken care of," Yeoh said. Despite its global success, getting there was no easy task for Crazy Rich Asians. The producers had trouble attracting investment since Asian-themed movies were not considered a hot item in Hollywood. In fact, the team was once asked by a studio to change the role of Rachel to a Caucasian woman, "which is crazy," Penotti told the Global Times. But eventually the team managed to find a studio that allowed them to stick to their original ideas for the film. Following Crazy Rich Asians' success, the tide in Hollywood has now turned. "In a short period of time we've seen a variety of [Asian-themed] films being relit, new stories being written and Asian actors are now catapulting to leading roles - these are our wonderful by-products and something that we should keep going," Penotti said. "The Asian community is thirsty to see themselves on the big screen represented in a real way… that's also what the audiences want. They're not happy to just have the token diverse Asian face on the big screen anymore, you have to give us real stories, characters that have dreams and hopes," said Yeoh. "The film might open a door for us, but it's up to us to keep the door open," she told the Global Times.